El problema es que Nuclear Blast marca estilo a los grupos, es como una factoría, son a las megaproducciones lo que Frontiers a los refritos. Yo no me preocuparía hasta que salga el disco, el que elige los singles en la discográfica es un puto genio hundiendo expectativas. En el directo que han sacado todos los temas ganaban mucho en frescura, en su momento ya dije que me habían gustado mucho mas que en el disco. Accept, presentará hoy jueves 3 de agosto en directo su nuevo disco en un concierto especial en el Wacken Open Air. Parte 1 - Un concierto clásico de la banda, lleno de nuevos y viejos éxitos. Parte 2 - Wolf Hoffmann tocará canciones de su álbum en solitario "Headbangers Symphony", lanzado en 2016, con la Orquesta Sinfónica Nacional Checa. Parte 3 - Accept compartirá escenario con la orquesta, apoyados por un complejo espectáculo multimedia. El concierto será el "Night To Remember" de este año, una tradición del Wacken en el que las bandas hacen una actuación única y especial en el festival. 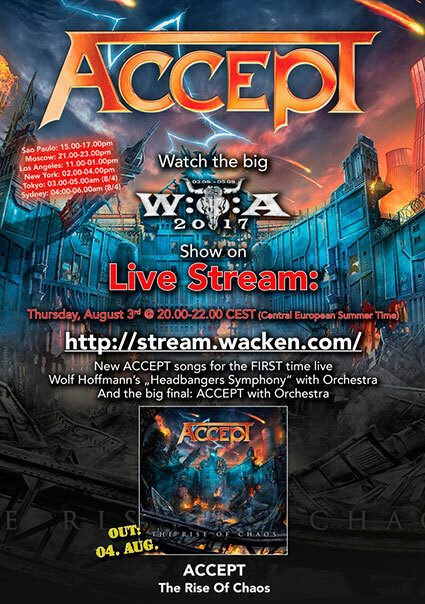 ACCEPT - worldwide live stream of the big WACKEN show, second track-by-track trailer revealed! 2017-08-02 - Heavy metal pioneers ACCEPT are back in the game with a new studio album! The record entitled »The Rise Of Chaos« (out this Friday on August 4th) will be the band's 4th studio release through Nuclear Blast and continues the tradition of its three predecessors - »Blood Of The Nations«, »Stalingrad«, and »Blind Rage« - with grandeur and precision. Part one will bring fans a classic ACCEPT set, packed with new and old hits. Part two will present another premiere: Wolf Hoffmann will be playing tracks from his solo album »Headbangers Symphony« for the very first time. On this record, Wolf has covered famous opuses by composers such as Beethoven, Vivaldi, and Mozart, in a metal guise. And in Part three, all elements can be seen and heard together: ACCEPT will make the holy Wacken ground shake by sharing the stage with the orchestra, supported by a complex multimedia show. This unique concert experience will take place on this year's »Night To Remember« which makes it even more special. The »Night To Remember« is a celebrated, long-lasting Wacken tradition; for one night of the festival a selection of established bands will do something unique and special with their performance. Wolf Hoffmann stated: "It's always impressive to see how bands take this evening seriously and how much love the artists and the organising team put into their work to get a varied result. It's a great tradition which underlines and documents the top-notch level of the international rock community like nothing else. We also want to present something that ACCEPT has never done before, we hope we can give something really special to the fans." 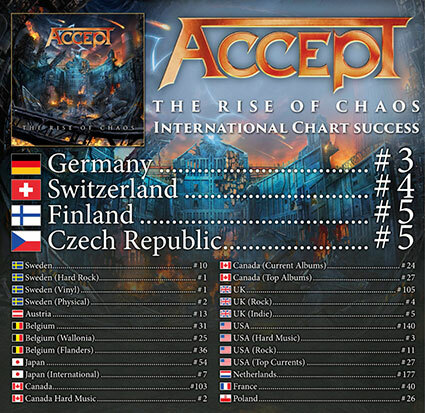 "ACCEPT have been and are still a very important part of Germany's heavy metal scene. We're really looking forward to having them with us once more. With this epic concept, the Thursday evening will be one to remember for sure," stated Thomas Jensen, organiser of Wacken Open Air. Vamos a mirarlo... en España entro en el puesto 31, en la segunda semana está en el 59. ACCEPT: nuevo trabajo en directo "Symphonic Terror - Live at Wacken 2017"
Accept lanzarán un nuevo trabajo en directo titulado "Symphonic Terror - Live at Wacken 2017" el 23 de noviembre a través de Nuclear Blast. Se trata de un concierto de 2 horas, filmado el 3 de agosto de 2017 en el legendario W: O: A. El concierto se dividió en tres partes: en la primera parte se interpretaron nuevas canciones como "Die By The Sword" y "Koolaid", así como las conocidas "Restless And Wild" y "‘Pandemic"... En la parte central el guitarrista Wolf Hoffmanna, acompañado por una orquesta sinfónica, presentó lo mejor de su reciente álbum en solitario "Headbangers Symphony". En la última parte, se tocaron acompañados por una orquesta, clásicos de la banda como "Princess Of The Dawn", "Breaker", "Fast As A Shark" y "Metal Heart", así como las nuevas "Stalingrado", "Shadow Soldiers" o "Teutonic Terror", cerrando el concierto con "Balls To The Wall". Lo que comenzó como un estreno mundial en el Wacken, continuará por Europa, en una gira con orquesta en la primavera de 2019. The German heavy metal legends ACCEPT are experiencing more success than ever, and have hit their stride creatively! In the 10th year since the band’s reunion, the quintet can look back on four top 10 albums in Germany, including an unbelievable #1 with »Blind Rage« (2014) and a brilliant #3 with their latest album »The Rise Of Chaos« (2017). 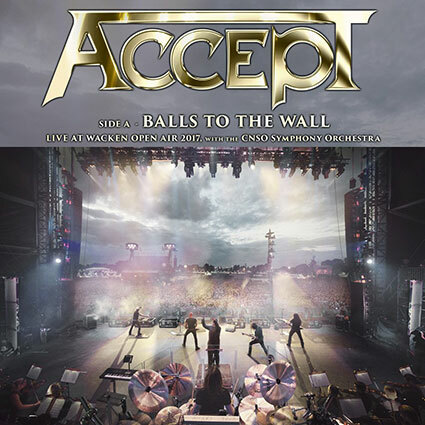 Six months after the success that was »The Rise Of Chaos« world tour,ACCEPT will start their festival season on the 22th of June at Rockfels Open Air, and will play headline shows at legendary Bang Your Head!!! in Balingen as well as at Rock am Stück festival and at Rock am Härtsfeldsee. They will finish the tour leg on July 28th as special guests to the legendary JUDAS PRIEST in Vienna. Over the past few months, the German band has been anything but passive, instead they‘ve been finalising their latest project, their upcoming live release»Symphonic Terror – Live at Wacken 2017«, which will be released on November 23rd via Nuclear Blast! Fans can expect a unique, 2 hour ACCEPT show, shot on August 3rd, 2017 at the legendary W:O:A, where the band played the biggest and most extraordinary show of their career in front of 80.000 live fans at the festival, on top of thousands more fans watching via the live stream! 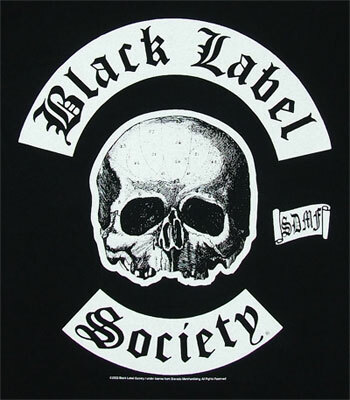 The show was divided into three parts, showing the full creative power of ACCEPT: The first part hosted the premiere of new tracks ‘Die By The Sword’ and ‘Koolaid’, as well as some of their most popular songs, such as ‘Restless And Wild’and ‘Pandemic’. The middle part hosted guitarist Wolf Hoffmannaccompanied by a symphony orchestra, presenting the best-of from his recent solo album »Headbangers Symphony«, which includes metal versions of some of the world‘s biggest classical compositions (e.g. 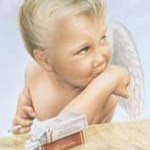 from Beethoven,Mozart, Vivaldi,…). And in the last but not least part, fans were able to bang their heads to ACCEPT anthems (also accompanied by the orchestra), such as ‘Princess Of The Dawn’, ‘Breaker’, ‘Fast As A Shark’ and ‘Metal Heart’, as well as to new songs like ‘Stalingrad’, ‘Shadow Soldiers’ or‘Teutonic Terror’. The finale could be nothing less than an 8 minute version of their eminent hit ‘Balls To The Wall’! Accept lanzará un single en vinilo edición limita de 10 pulgadas, "Balls To The Wall / Symphony No.40 in G Minor", el 5 de octubre a través de Nuclear Blast. Ambas canciones pertenecen a su próximo álbum en directo "Symphonic Terror - Live at Wacken 2017", que saldrá a la venta el 23 de noviembre. 2018-08-24 – The German heavy metal legends ACCEPT are releasing a very special, limited 10 inch vinyl single “Balls To The Wall / Symphony No.40 in G Minor”, which will be released on October 5th via Nuclear Blast . 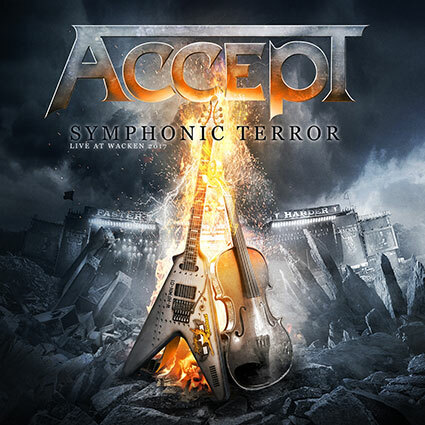 ACCEPT: portada y lista de temas de "Symphonic Terror - Live at Wacken 2017"
Accept lanzarán "Symphonic Terror - Live at Wacken 2017" el 23 de noviembre a través de Nuclear Blast.